Dark chocolate and benefits, yes the dark chocolate which sounds really delicious and mouth-watering which is probably favorite to the most of the people has many benefits. Some people may dislike because of its bitter taste but after reading this article all of you would be adding dark chocolate in your routine.Dark chocolate is derived from cocoa beans this is rich in nutrients like iron, zinc,copper,magnesium most importantly flavonol which have worth mentioning positive effects on your Skin and hair.There are many benefits of eating Dark chocolate for skin and hair.If you wish to have healthy skin and hairs you should surely include it in your daily routine. 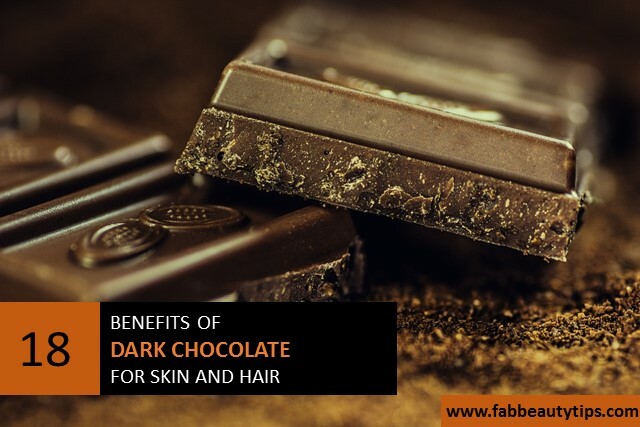 I have mentioned many benefits of dark chocolate for skin and hair. Dark chocolate has antioxidants like polyphenols, flavonol, catechins, which decreases the production of free radicals due to which your skin looks soft, supple and glowing.This is one of the important benefit of dark chocolate for Skin. It has super absorbent properties especially it absorbs all the harmful UV rays and UVB rays and give you complete sunscreen effect. Eat cocoa beans to get the most protection. Dark chocolate aids in the distribution of red blood cells. Flavonol present in it will improve blood flow so this will add a glow to your skin. Dark chocolate decreases the higher stress hormones and boosts wonderful stress relieving qualities and this finally adds a glow to your skin. Dark chocolate with caffeine makes the noteworthy combination for the healthy skin this will slough off all the dead cells and allow the skin to breathe freely. Due to the shedding of dead cells scars also become lighter initially and it will disappear gradually. Dark chocolate is enriched with vitamins and magnesium due to which cell healing increases. Dark chocolate improves blood circulation furthermore it makes blood capillaries healthy and helps them to draw more oxygen and nutrients, therefore your skin looks healthy and glowing. As dark chocolate reduces the level of stress hormones this will result in less collagen breakdown in the skin and finally, this will lead to fewer wrinkles. Since, it has magnesium in it which helps in collagen production. Flavonol present in dark chocolate improves skin hydration and thickness which results in healthy young-looking skin. Dark chocolate has a good amount of vitamin C and in addition to this, it facilitates the shedding of dead cells which in result improves complexion. Furthermore, it keeps your skin hydrated which gives a supple and dewy glow to your skin. Dark chocolate is full of nutrients and various vitamins. Adding dark chocolate to our diet on daily basis give us iron, copper, magnesium, riboflavin, niacin and Theobromine this fulfills our daily need for these nutrients. Therefore, this will result in the healthy and glowing skin. Eating Dark chocolate daily will help your Hairs in many ways listed below. Dark chocolate has copper, zinc, magnesium in it. These minerals enhance the cell growth and in addition to this daily intake of dark chocolate will result in increases the flow of oxygen and blood to your scalp which finally leads to healthier and stronger hair. When you eat dark chocolate it produces compounds which are anti-inflammatory. It prevents scalp infections and furthermore promotes healthy hair growth. Nutrients like zinc,iron and copper present in dark chocolate promotes hair growth.It will make your hair strong and in addition to this dark chocolate also gives lustrous look to your hair. Dark chocolate improves the blood flow and this will finally promote hair growth moreover, this circulation boosting action will fight against hair loss. Dark chocolate adds extra luster and shines to your hair. You can make your very own hair mask by adding simple ingredients like yogurt and honey mixed with dark chocolate this will add luster to your hair when you want. Daily intake of dark chocolate will help you fight hair loss. Zinc iron and copper will help to make your hair strong and nourishes your scalp and increase hair growth. Due to high absorbent properties, dark chocolate will give protection against sun damage and hence this will keep your scalp hydrated too. As dark chocolate improves circulation it also makes oxygen and blood flow better therefore keeping your scalp conditioned. Dark chocolate is rich in nutrients like copper, magnesium, iron, zinc these will make your hair strong and give strength to fight against all hair problems. 1. It is recommended to eat 30g-60g dark chocolate daily. 2.It is recommended to eat dark chocolate with cocoa at least 70 percent. My love for dark chocolate has increased even more after reading your post. I love munching on dark chocolate.. Glad that it has so many skin and hair benefits. Thanks for the article. I never knew about the benefits of dark chocolates. Thanks for sharing! I just love to eat dark chocolates. But i wasnt aware that it has so many benefits to our skin and hair. Very informative post. see I always knew dark chocolates were good. 🙂 Jokes part quite an informative post. Oh wow I wasn’t aware of these amazing benefits of Dark chocolate. Great post. Hey!!! i love dark choclates but din know its use and now i will love it even more!!! Wow.. so many benefits of dark chocolate, I just always ate it only for my cravings. But now I need to give it a place in my diet. Much informative post.